Finally, my 2nd Optimus Prime sharing (the previous one is the nemesis Optimus Prime GTR) although i have a few Optimus Primes at home. 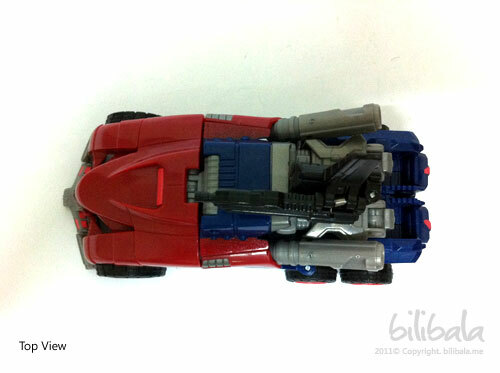 This time, would like to share with you all the Optimus Prime from Transformers Generations series. 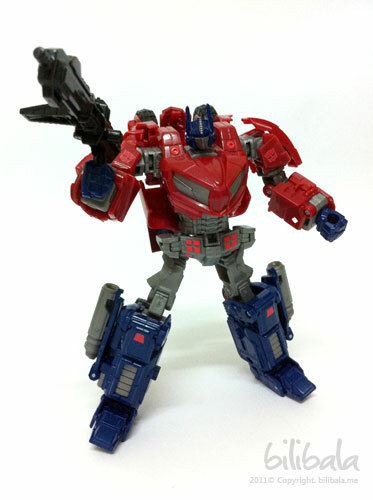 For those who has played the Transformers: War of Cybertron game, you won’t be a stranger to this form of Optimus Prime. It is quite a resemblance of what he is in the game. He is quite a cool robot to be owned and especially the transformation for this small deluxe class is surprisingly complicated which i do have a hard time transforming him. 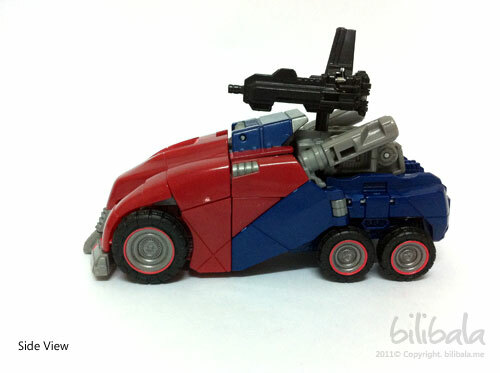 The alternate mode for Optimus Prime is a Cybertronian truck. To me, the truck itself is quite sporty and with 2 afterburners at the side. Much similar to the truck in the WOC game anyhow. A quite unique design which i like is the side profile of the truck. 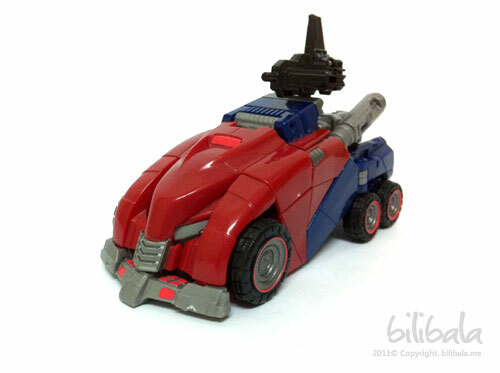 Notice that it has design of polygons at the side which is quite uncommon in my Transformers toy collection. The cannon that is being attached to the top is actually detachable and expendable. I will elaborate more in the gimmicks section below. 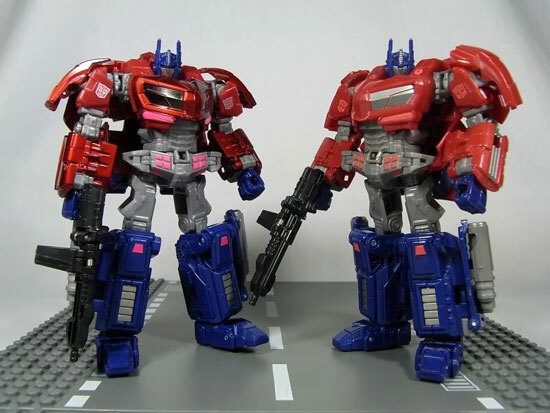 There are actually 2 primary colors being used for this figure which is the Optimus Prime default color scheme: red and dark blue. The rest of the colors range from grey and black. There aren’t any chrome part for it. Anyhow, they have made use of some neon luminance red on parts of vehicle like the lights on the front bumper and the rear light. The rear light of the vehicle is neon luminance red painted. 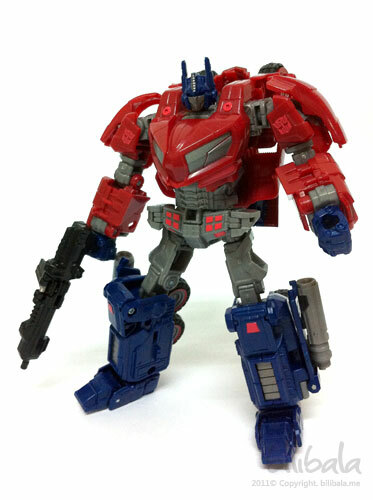 I particularly love this design of Optimus Prime as it has more curve parts compared to other Optimus Prime I have. The overall features he has is quite nice as well. Anyhow, there’s a downside of him. I found that he has limited articulations for nice confident pose. And it is a bit difficult to make him stand properly partly due to the design for the leg is not as “ground gripping” and tend to be too squarish. I personally don’t like the design for the lower body, especially the leg portion as i think it is too boxy and squarish anyhow. I like the front wheel being retracted to the back of the robot. It makes him look like he is having a jet pack or something. 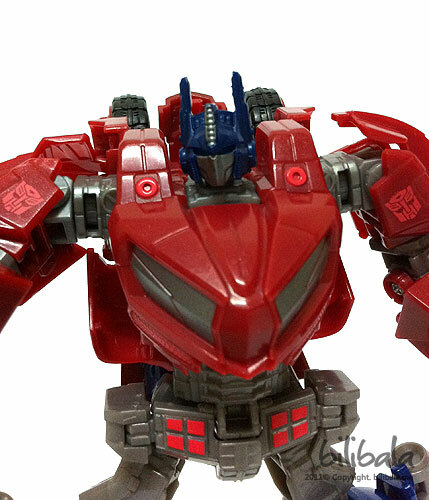 A close up shot to Optimus Prime. 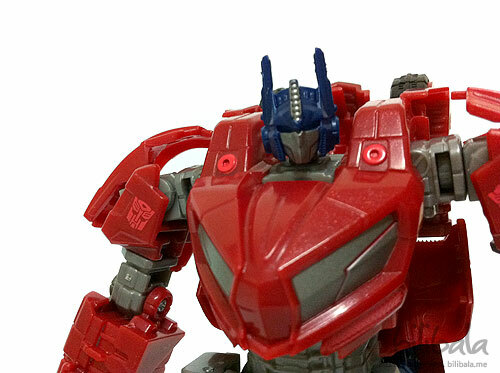 See that there’s quite a bit of detail on the head piece of him. 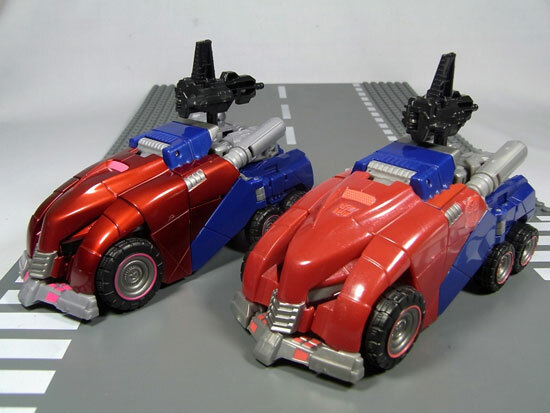 There are 2 gimmicks for Optimus Prime generations. 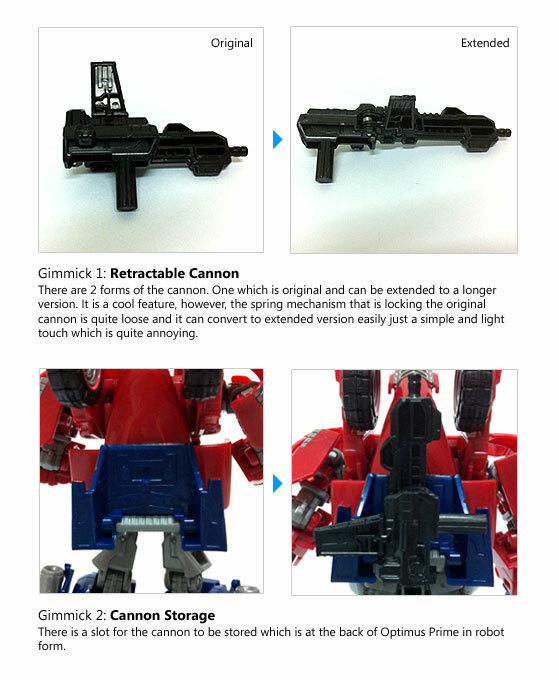 So both are of the same mold and robot that we are having here. What is being the different is just their color and paintwork. As mentioned earlier in Transformers Generations Soundwave , Transformer United is from Takara Tomy and the color for this line is normally metallic and pricey of course. But having to pay that price is quite worth it, cause the robot does look differently with the metallic paint. How different? A LOT different if you can see the picture below. 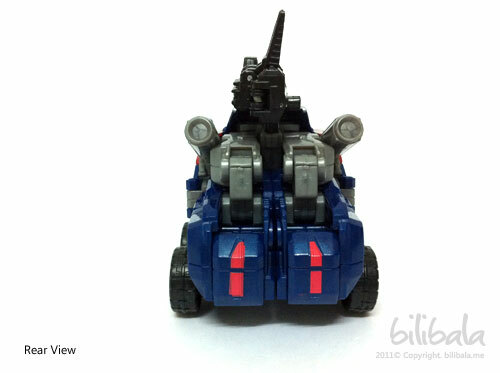 It is quite obvious especially in the vehicle mode for both the version. So if you really have the budget, i think is quite worth to add another RM30 for the United version which really worth the buck for it. 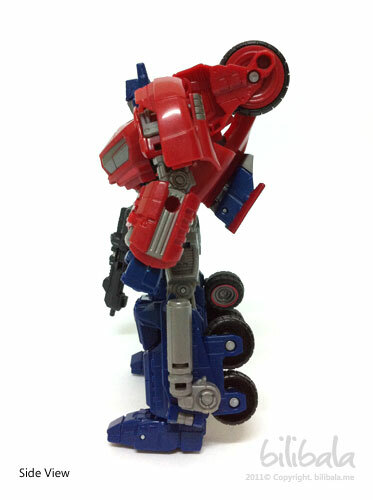 It is quite a cool Optimus Prime to have around. 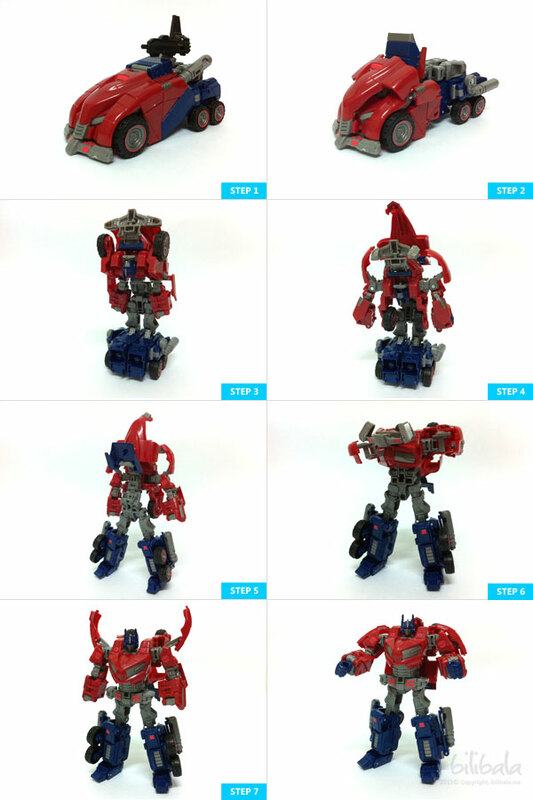 The complicated transformation is worth the money as it does transform like a leader class toys despite being a deluxe class. If you have the United version, the metallic touch will definitely add in more marks for the details that it brings out. However, I personally don’t like the design for the lower body part (i.e. the leg portion) and the VERY loosened retractable hand cannon which i always accidentally flip it with a light touch. I would give him a 7/10 for my collection. 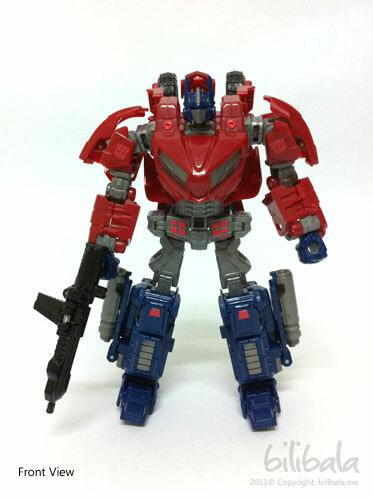 this is official favourite modern Prime of all till now. 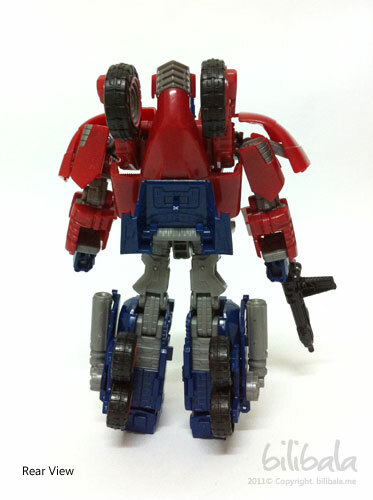 I hv the takara ver. as i feel the red paint is kinda dull.